If Hollywood could engineer a best actor, best actress, and best picture based on all of the previous winners, what would they look like? 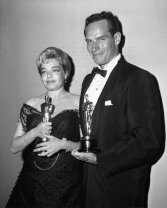 In the entire history of the Oscars, but all eight of the Best Actor and Best Actress winners have been white. That dubious distinction continues this year—all 10 nominees are white. Adrien Brody is the only Best Actor winner under 30. Only seven best actor winners have been under 5'8''-Dustin Hoffman won twice-and no woman taller than 5'11'' has won best actress. Movie stars change their hair color too frequently to track, so we grouped winners by their hair color in the movie for which they’re nominated. Brunettes outpace blondes and redheads—and grey-haired Best Actress winners are a rarity. Relatively few actors with green eyes have won—but this year there are four green-eyed nominees. Most winners have never been nominated before the year they took home the Oscar. Katharine Hepburn won Best Actress four times, more than anyone else. Daniel Day-Lewis leads all other actors with three wins. Most winners are first-timers. The last comedy to win Best Picture was Annie Hall in 1977. This year two nominees fall loosely under this category—The Grand Budapest Hotel and Birdman. Most films that win Oscars are released later in the year, close to the time nominations are decided. The Best Picture with the smallest budget: Marty, in 1955. The biggest-budget winner: Titanic, in 1997. Of the 2014 nominees, American Sniper has performed best at the box office. The Best Actress would be a white 30-something, 5'4'' to 5'7'' tall, with brown hair and blue eyes, who'd never won an Oscar or been nominated before. 6' or taller, with brown hair and brown eyes, who'd never won an Oscar or been nominated before. The Best Picture winner would be a drama, between 121 and 160 minutes long, released in the final months of the year by Columbia Pictures, that had an average budget of $40 million, and grossed $290 million at the box office.